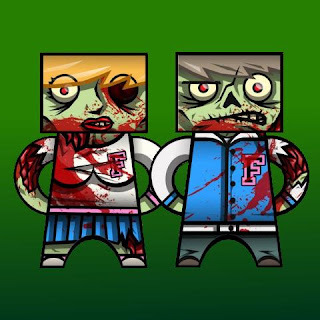 Adam Steel at the Tiny McDoodies blog had added to his Zombie Prom collection of paper toys. This time it is a cheerleader and a jock. Previously released were a zombie prom queen and king. Download the creepy zombie goodness here. 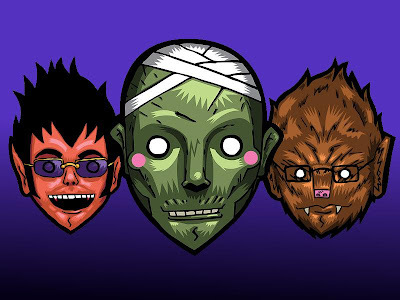 Here are some nifty printable monster masks created for Halloween a couple of years ago by artist Emory Allen. The somewhat cheerful group includes Suntanned Vampire, Naked Mummy, and Studious Werewolf. The masks may be downloaded individually here, here and here. 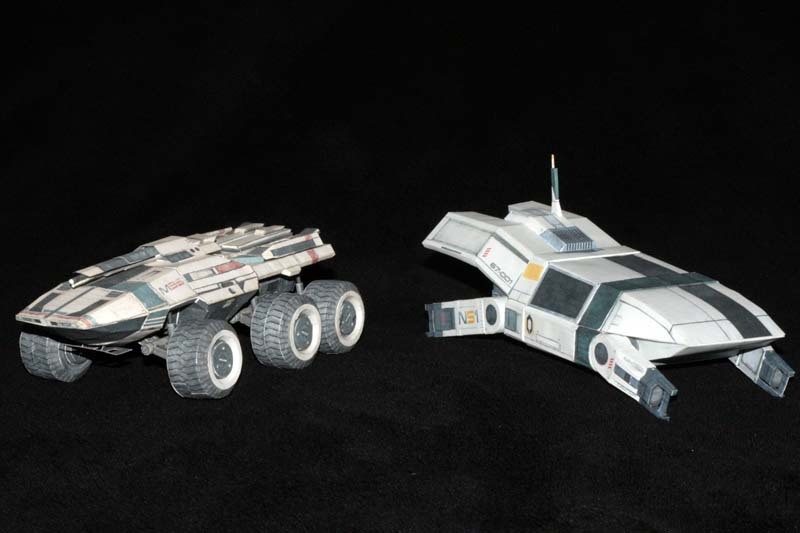 Here are two paper models of vehicles from the Mass Effect 2 video game. On the left is a M35 Mako infantry fighting vehicle, whose weapons are described by the Mass Effect Wiki as a "turreted 155mm mass accelerator cannon" and a "coaxial-mounted machine gun". On the right is a Kodiak drop shuttle. Both these papercraft models are the creation of deviantARTist ThunderChildFTC and their templates may be downloaded here and here. I have been slacking off on my pizza paper toy series. The last pizza toy I released was back in February 2010! Here is finally a new one. 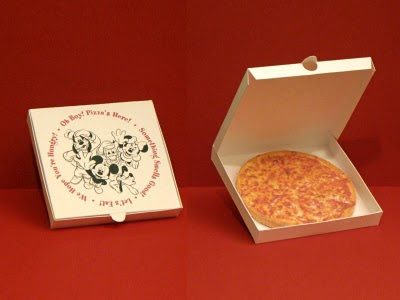 When you order a large pizza at any one of the many resorts at Walt Disney World in Florida it comes in a box with a picture of Mickey, Minnie, Goofy, Donald and Pluto on the lid. This paper toy is a mini version of that box. The pizza inside is a plain cheese pizza, 'cause that what the little ones like best. 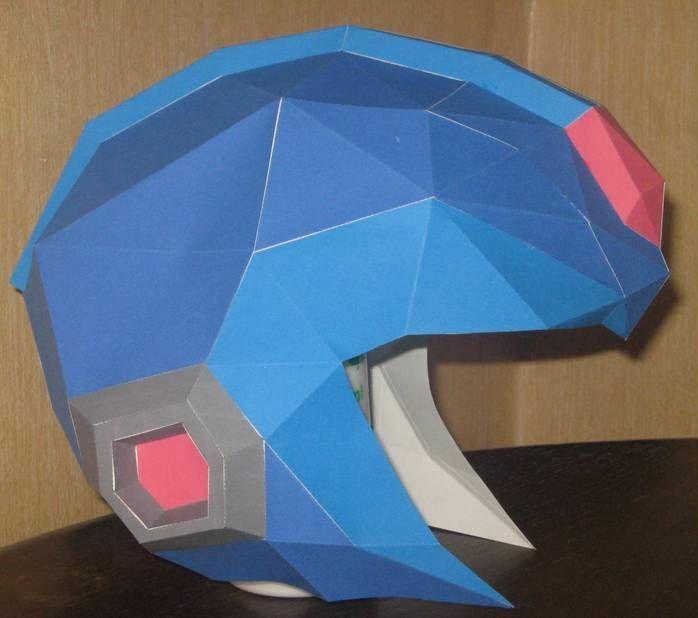 :) The template for this paper toy may be downloaded here. In the original 80's Transformers cartoon, the Decepticon Soundwave has the alternate form of a analog cassette tape player. Soundwave is able to eject various "Spy Cassettes" which transform into animal-like Decepticons. The paper models above are two of Soundwave's Spy Cassettes, Laserbeak and Ravage. Ravage is the work of Kook at the Paper Invaders website, while the creator of Laserbeak is unknown. The templates for the models may be downloaded here and here. Both build photos above are by Cayley. Noturno Sukhoi and Cuguel have teamed up to create a series of paper models that illustrate the life cycle stages of the xenomorphs seen in the Alien franchise of movies and video games. Pictured above are a sampling of the models available. Starting on the right and going counterclockwise, we have a xenomorph egg, a "face hugger", and a "chest burster". 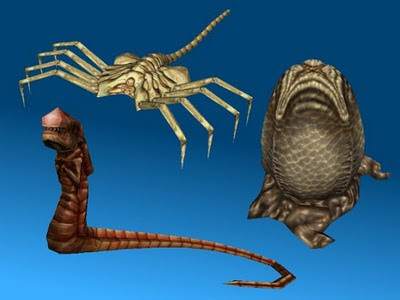 Although it is not stated on Noturno's website, these papercraft models appear to have been created from 3D models from one of the Aliens vs Predator (AvP) video games. Each of the above models is 1:1 scale and their templates may be downloaded here (Pepakura PDO format only). Also available on the same page are two 1:2 scale models of full grown xenomorphs. Back in 2008, a German model railroading enthusiast (who is also a Harry Potter fan) wowed the online papercrafting community by releasing a complete N scale paper model of Hogwarts Castle. Part of the release included a paper model of the Quidditch Field at Hogwarts. 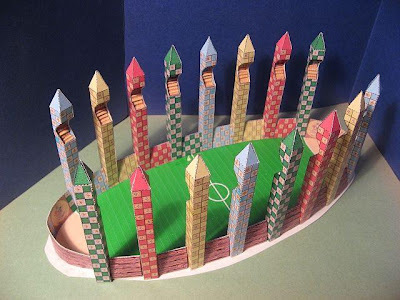 The Quidditch Field is a papercraft gem that may have been overlooked by many people in the larger release of the castle, so today I am giving it the recognition I think it deserves. ^^ The template for the Quidditch Field may be found here along with the templates for the other buildings at Hogwarts. Here's a paper model by Cyberdrone of a fictional arcade cabinet for a fictional video game. ^^ The video game Space Paranoids appeared in the original Tron movie, but was never produced in real life (that is, if you don't include the custom cabinets at Flynn's Arcade in San Diego). 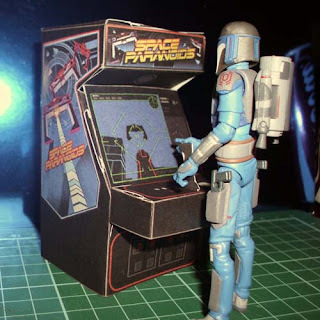 Just the right scale for action figures, Cyberdrone's papercraft model of the Space Paranoids cabinet is based on the glue-less Cubeecraft method of construction. The template for the video coin-op may be downloaded here. 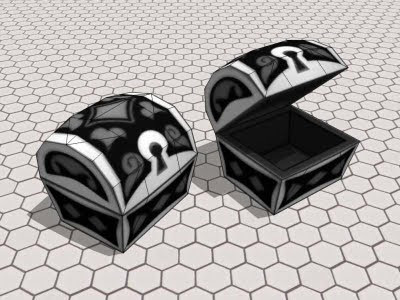 I have completed an eighth Kingdom Hearts II treasure chest papercraft. In the KH2 video game, this treasure chest can be found in the Timeless River area. Timeless River is world from the past modeled after Disney's 1928 black and white animated short, Steamboat Willie. 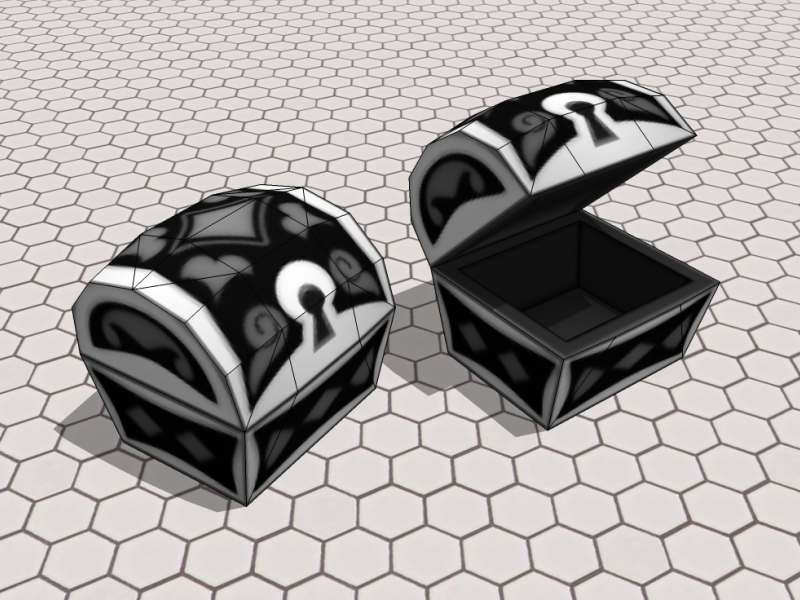 The template for this treasure chest may be downloaded here. The sci-fi television character Doctor Who has gone through many different incarnations over the years. Papercrafter "Ditch-scrawls" has captured the distinguishing features of the 10th and 11th doctors in paper toy form. The templates for the two doctors are located here and here. 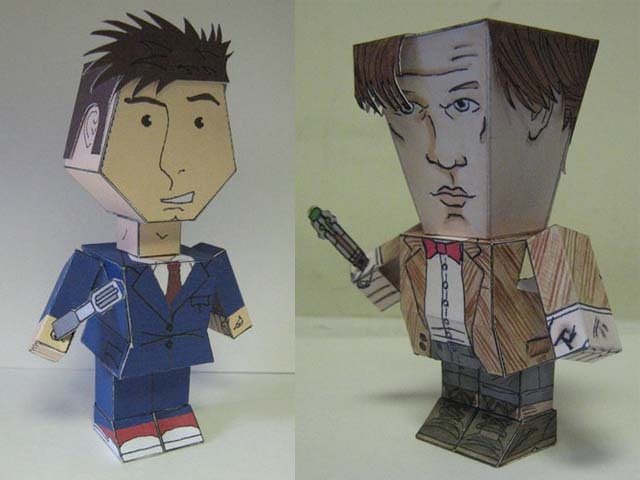 The paper toy of the 10th doctor comes with an optional overcoat. The storyline of the Rozen Maiden anime involves living dolls who fight one another in the "Alice Game". This papercraft is a chibi version of the fourth Rozen Maiden doll, Souseiseki. Souseiseki fights with a pair of scissors and has the power to enter other's dreams. 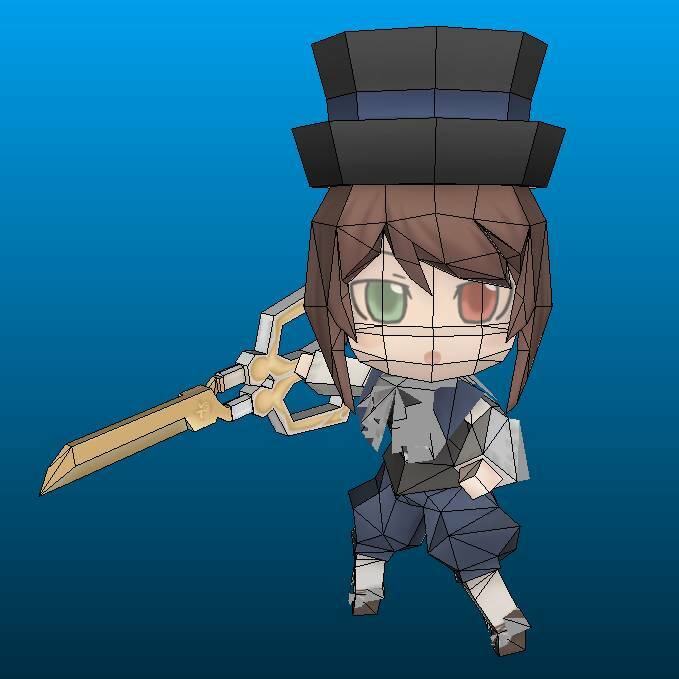 The papercraft template for Souseiseki was created by Kudan and may be downloaded here. Relakkuma (Relax Bear) and his bud Kiiroitori get another papercraft makeover. This time they are dressed as Mario Bros. characters! 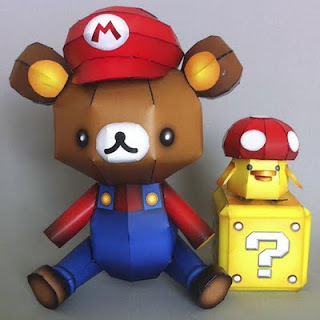 These cute papercraft models are the work of deviantART member Ikarusmedia. The templates for the models are posted here. Previously, Relax Bear was given a heavy metal rock makeover. To date, the Capcom character Mega Man (a.k.a "Rockman") has eleven different video games that bear his name. This full size, wearable paper model is of Mega Man's helmet as it appears in Mega Man X. The model was created by Zorn Taov and his template may be downloaded here. 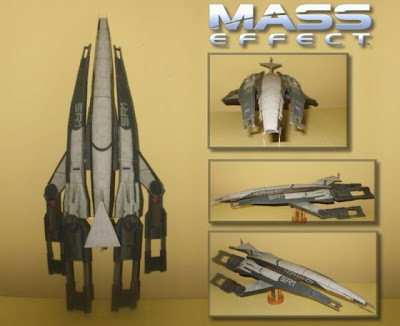 Zorn created the model from scratch and did not make use of a 3D model from the video game. The build photo above is by Paperart. This jackpot of papercraft Russian cars is the work of Vlad Tarnavsky. 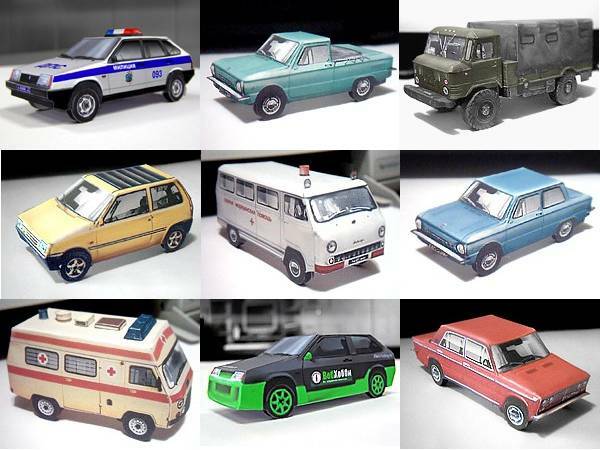 Vlad's collection includes ordinary cars of all types as well as vans, trucks, police cars, ambulances, and race cars. Over forty different 1:32 scale car templates are available for download, each one in .jpg format. Vlad's website is located here.